For the past several months, my 10 year old daughter has been having trouble getting to sleep. She tells my husband and I-- that she's scared. She can't explain exactly what she's scared of, but she 'just is.' She's been double checking the locks on the doors and windows because something scary could come in. She's been spending hours awake, not able to relax and sleep. We have tried everything to calm her down! Special prayers, Bible reading, night lights, sleeping with the lights on, new pillows, different beds, music playing, white noise playing, set bedtime routine, warm baths, door open, door closed, later bedtime, earlier bedtime, no movies or books that may have scary things, no TV, no screen time before bed, etc. etc. etc. 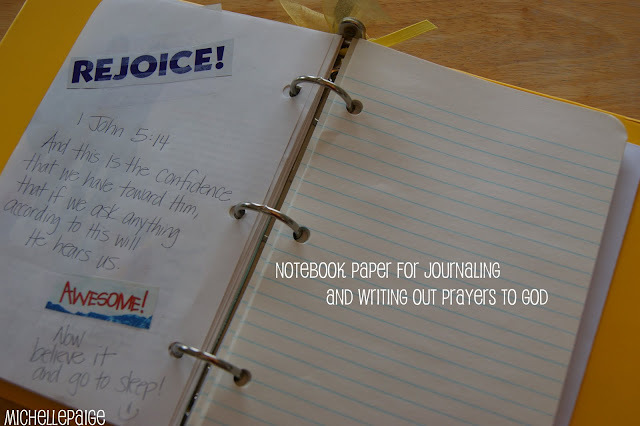 prayers were answered with this notebook idea. 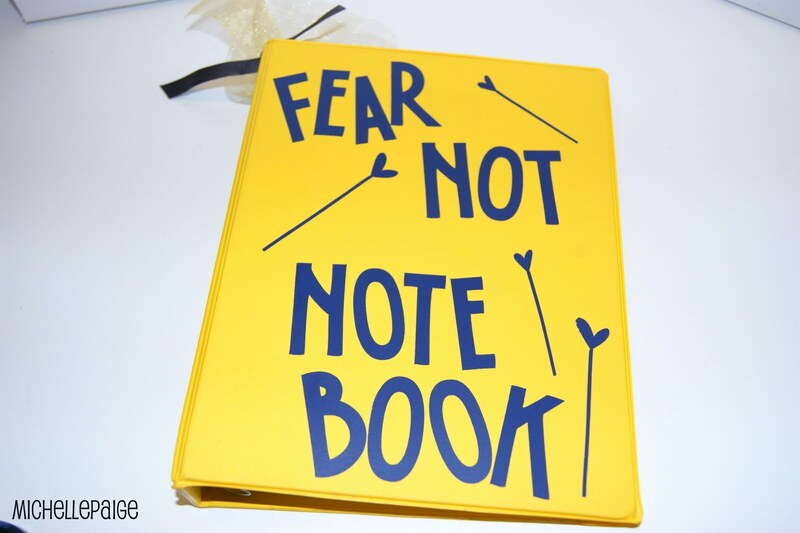 Yes, it sounds crazy, but this 'FEAR NOT NOTEBOOK' has really made a difference! Take a look! We took the 'use what you got' and the 'get it done, quick' approach with this notebook. Using old magazines, we ripped out pages of pictures that brought my daughter happiness and joy. She loves animals, oceans, flowers, fields, etc. 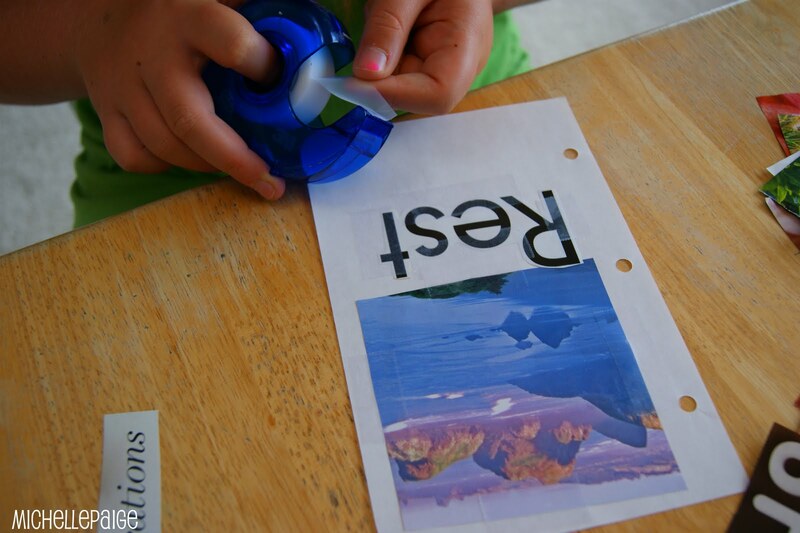 We also cut out words that would bring a sense of calmness. Words like: rest, bloom, relax, sleep, love, rejoice. 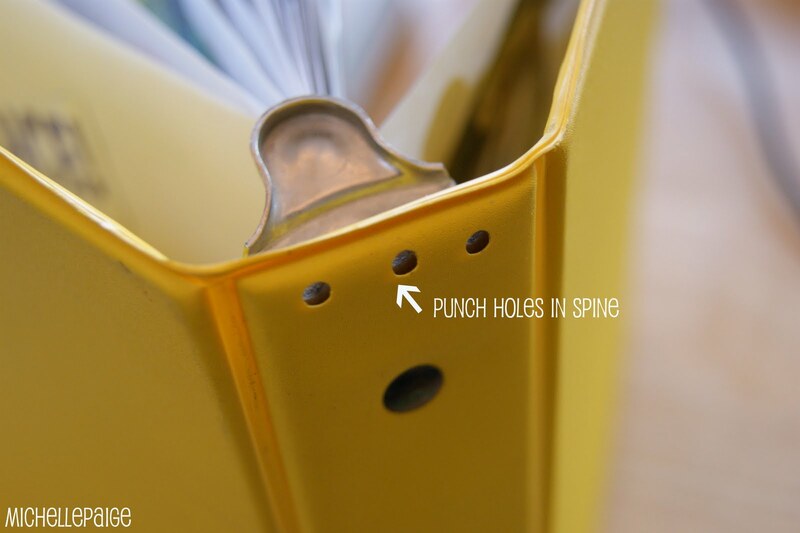 We already had a small yellow binder (7"x 9") that worked perfectly. We taped (yes, good old Scotch tape) the magazine pictures and words right onto a piece of hole punched paper (5 1/2"x 8 1/2"). 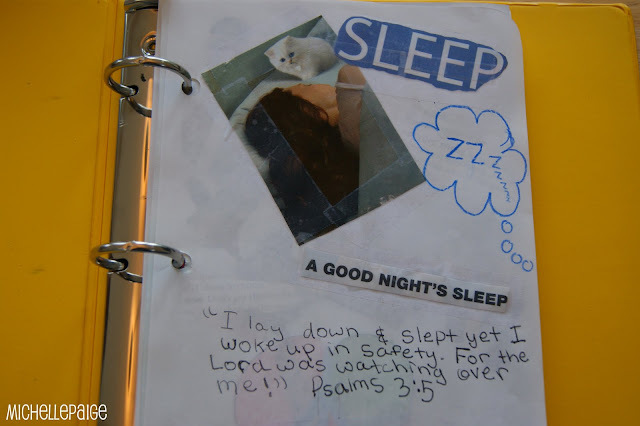 We then looked up Bible verses that had to do with God's protection, peace and sleep and wrote them on the pages. 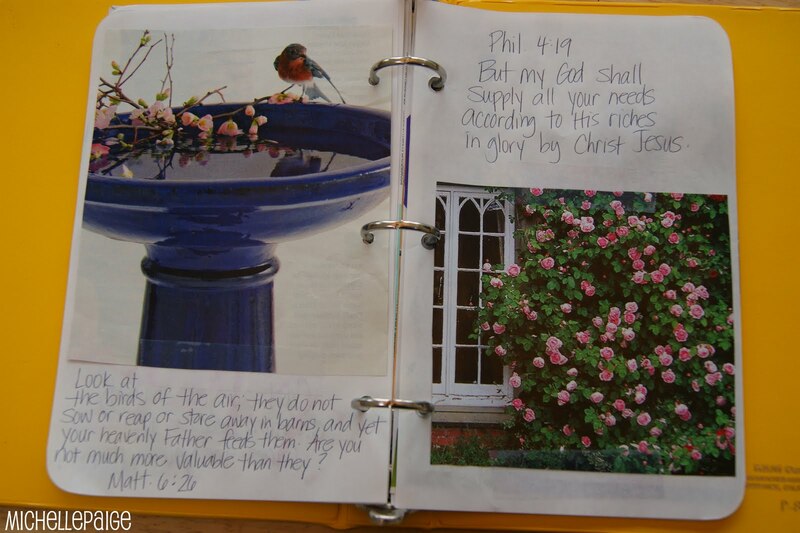 Here's a look at some of the pages we made. I lay down and slept yet I woke up in safety. For the Lord was watching over me. I will lay down in peace and sleep, for you O Lord will keep me safe. Look at the birds of the air, they do not sow or reap or store away in barns, and yet your heavenly Father feeds them. Are you not much more valuable than they? 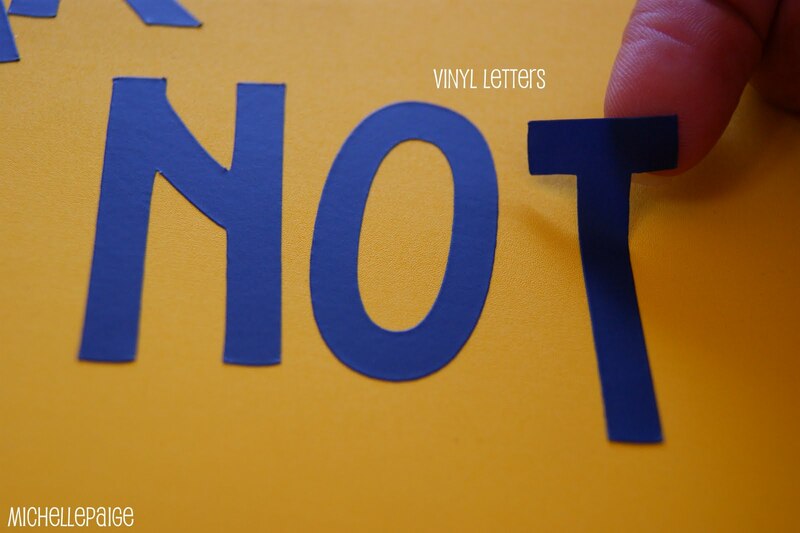 Be careful for nothing but in everything let your requests be made known unto God. And the peace of God, which passes all understanding shall keep your hearts and minds through Christ Jesus. This page would totally GIVE me anxiety (8 babies holding juice on white carpet), but my daughter loves babies! We made about 15 pages and then put in a section of lined paper for my daughter to write down her prayers to God. 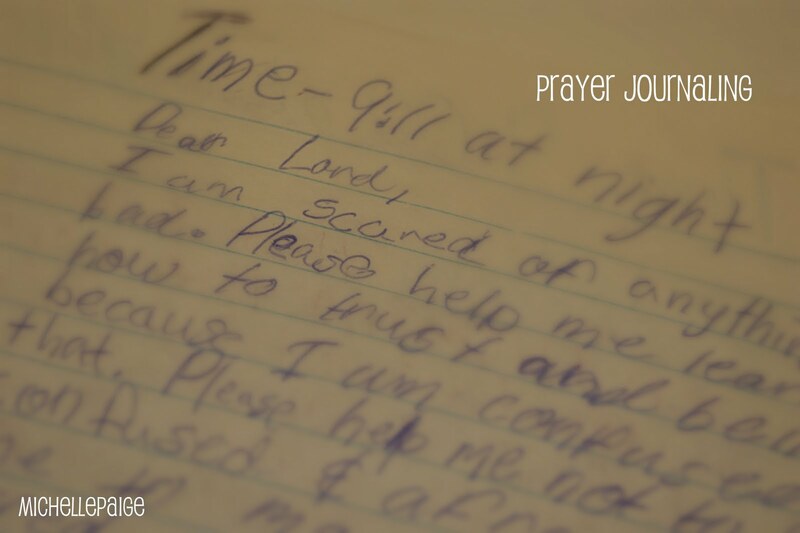 Her written prayers made me cry. To see inside the mind of a very scared/confused adopted 10 year old...it's tough stuff for a mom. 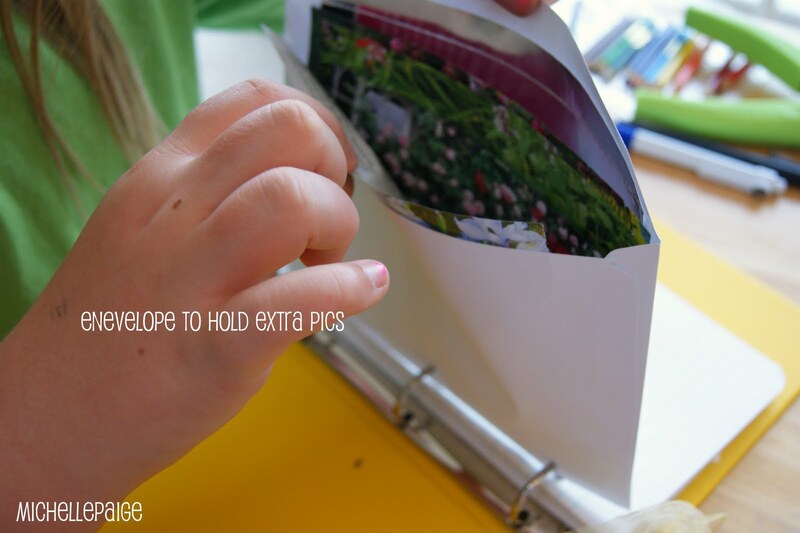 We also put in an envelope to hold extra pictures and words to make more pages. Using the Cricut cutting machine, we cut out vinyl letters to decorate the notebook. And of course, every project needs ribbon! I punched three holes into the binder's spine. 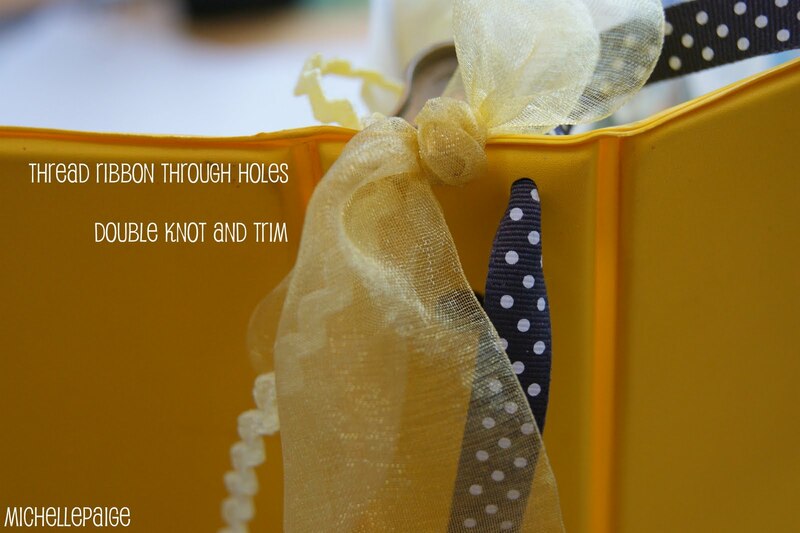 Three different ribbons were threaded through the holes, tied into a double knot and trimmed. It's been 3 weeks since we have made this notebook. 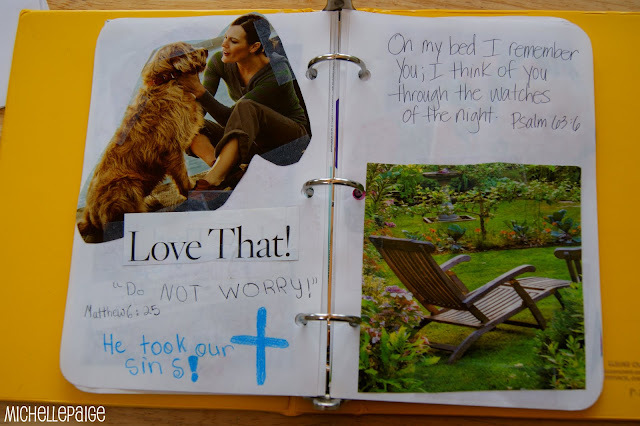 Week 1: My daughter used this Fear Not Notebook every night. She read through each page, wrote out a prayer to God AND went to sleep quickly!! 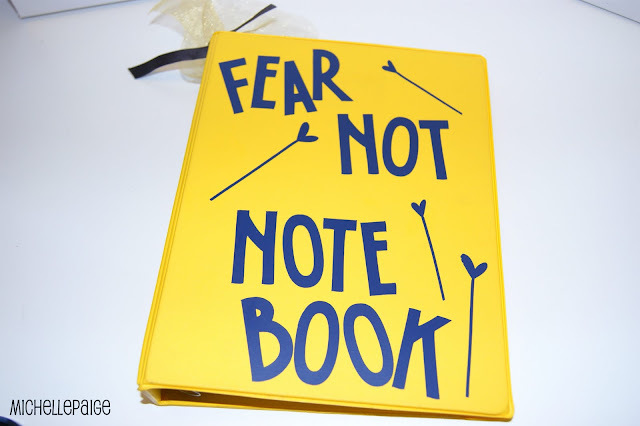 Week 2: The Fear Not Notebook was only looked at once or twice with no troubles sleeping! 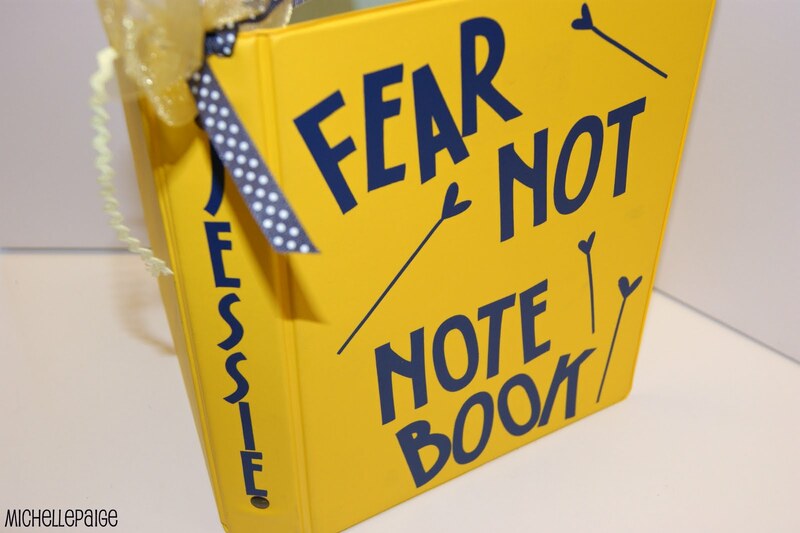 Week 3: The Fear Not Notebook is sitting on her nightstand untouched! She's sleeping effortlessly! Linking up to: StuffandNonsense, AtThePicketFence, SassySites, FrugalGirls, SerenityNow, Tatertots&Jello, UndertheTableDreaming, CraftoManiac, J&M'sEyeCandy, InCourage. I love this idea. It could be used by anyone who has trouble sleeping. When I was her age, I was scared like that at bedtime, too. I saw a woman on TV say that if you're ever scared, say to yourself "God, surround me with the white light and take my fears away." Sounds silly, right? It worked. We just have to find what works for us, and it sounds like you found what worked for your daughter! Nice job! I think this is such a brillant idea - congrats on you to working through this issue - When I was about 10 I saw a man climb through my bedroom window (I was in a loft above) and climb right back out due to our dog...but I swear that one moment has caused me more anxiety in my life...you never know what a trigger could be for someone...I think this is wonderful too because it gives your daughter some "power" back in helping herself. what a cute idea!! I LOVE it!! Thanks so much for linking up to Sassy Sites for our FFA party! Have a FABulous Friday!! 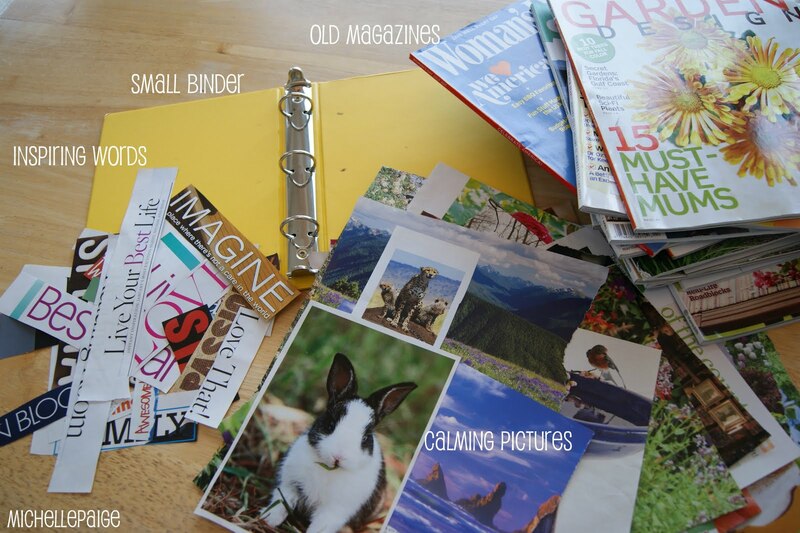 You have a cute blog,with many nice ideas..so very smart..Love it..
What an absolutely wonderful idea! I'm so glad it worked for your daughter. Thanks for visiting Texas Cottage. What a wonderful idea! What a loving mom! And what a faithful God to give you just the help she needed. I have a scripture written on an index card in my bedside table "..He grants sleep to those He loves.." Ps. 127:1-3 I've read it many times to get back to sleep. I have a child with severe anxiety issues, and I'm now interested in making one of these notebooks with him. He's reading on his own very well now, so I like the idea of including encouraging scripture verses that he could read over and over. This is really wonderful. Thanks so much for sharing! Thank you for this great idea! We have tried numerous ideas with our dd. We'll be making one soon. This is an amazing and inspiring idea, Michelle!! Love it! So glad you commented on MFTM today so that I could discover your blog :) I am your newest follower. 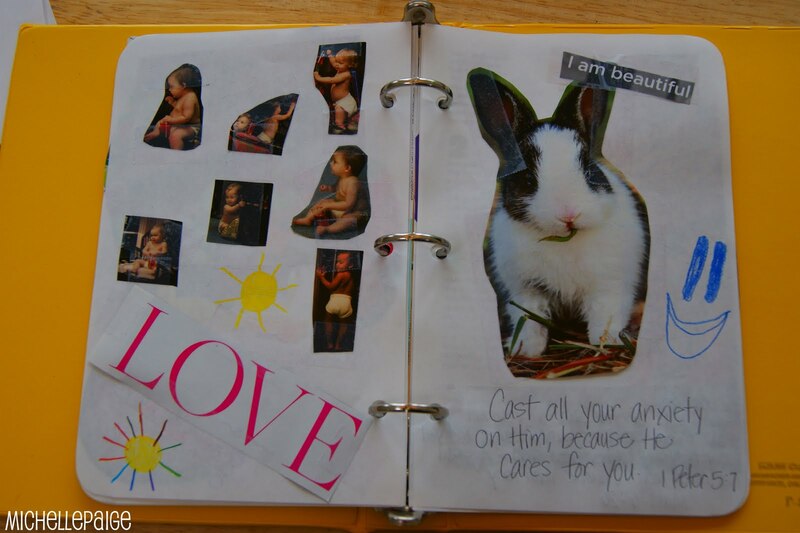 What a beautiful idea, and great gift for your child, to be comforted in such a loving and creative way. Absolutely an answer to prayer! Thanks for sharing this. I found you through Help A Momma Out. We have a lot in common! I am a Learning Specialist... and one child with a good amount of anxiety. What a beautiful idea and post! I would love for you to link up Thursday (actually it starts tonight) to It’s a Party! I have a daughter (10) with ASD and she "worries" or thinks of things to worry about only at bedtime. I am going to use your idea for this to create an Anxiety Book. This book is amazing and I love it! Awesome how God answers our prayers. I want one for me ;) (I am a baby and am afraid of the dark) Thank you so much for sharing it with us! What a great idea! I am so glad I stopped by from the (in)courage post! Wonderful, do you think this would work for a 30 something girl. I have trouble sleeping at night. I have a Joyce Meyer book with scriptures, I could use for my journal. Thanks for sharing! Yes, I do. Focusing your mind on the good things of God rather than the fear of what might happen and trusting Him to care for you will help. This is a great tool to help you. I personally love the verses in Philippians 4:4-9. What a wonderful idea. How powerful and comforting are the Scriptures. I would like one for me, too! Thanks. Years ago my daughter (age 4 at the time, 29 now) had horrible problems with fear particularly of storms. We couldn't even get her to go from the house to the car if there was the slightest breeze. I was working, my husband was out of work during the '80's recession. 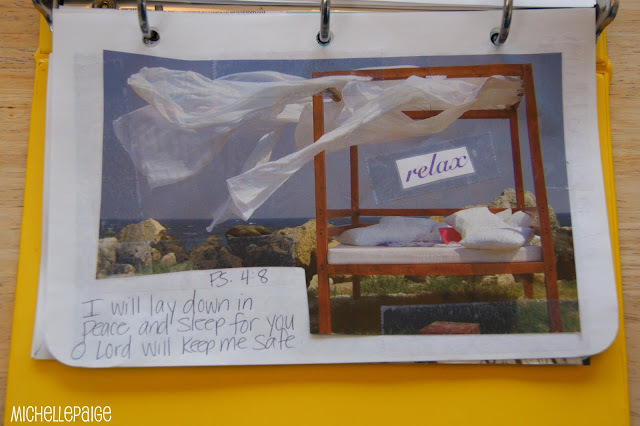 He made a poster of verses about God's protection, and helped her memorize them. (We would have loved to have this book idea then) We prayed, and prayed and prayed. I mean this child was paralyzed with fear. God answered our prayers. Just after she turned five, the fear disappeared. Sometimes we joke that we prayed too hard. She has been on numerous mission trips to countries I can't even mention, and lived by herself in the Middle East for 2 years! My 10 yr old son is having bad dreams & trouble sleeping & I just happened to hear about this notebook on the radio in the car tonight & thought I should check it out. This is a wonderful idea, and he's very excited to try it & see if it will work for him as well. Thank you for sharing such a wonderful, God-inspired idea!! 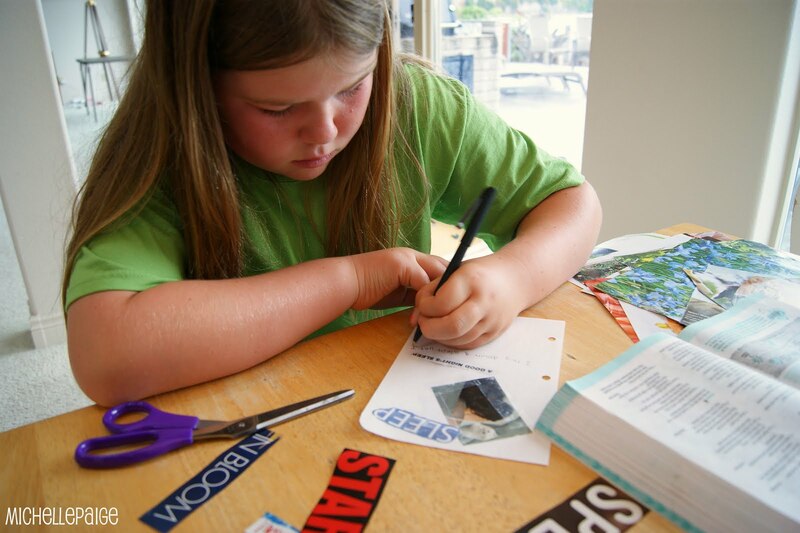 You heard about my daughter's notebook on the radio? Seriously? What station and city do you live in? I had no idea! Hopefully this idea will work with your 10 year old son. I'd love to hear the results. Thanks. You've done such a great job, Michelle! Michelle, my blog deals with fear and anxiety. In strolling around Pinterest today, I stumbles on this wonderful idea! I'm sharing it on my blog's facebook wall and tweeting it as well! I know the idea will resonate with 'fraidy cats'...including grown up ones! Blessings on your and your dtr. Thank you for blessing my day! I am so thankful to God that He let me come across this post. I wasn't even looking for anything like this, but it could be an answer to prayers from our home. My daughter is 12, and has such anxiety and fear each night. 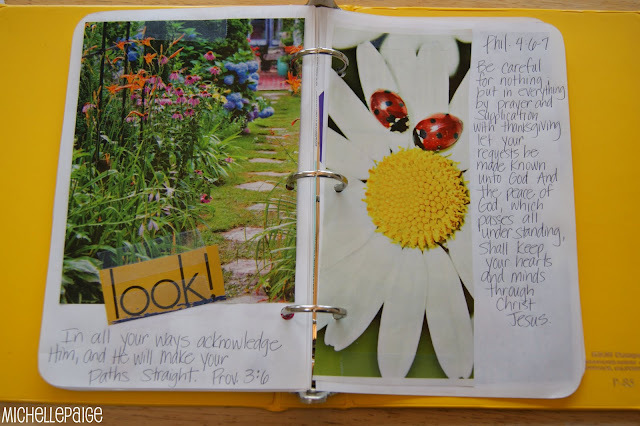 I don't know that she will want to do as many pictures, but the verses listed here are sure to bring some comfort to her. I sit here with tears in my eyes as I read each one. I can't wait for her to come home from school and show this to her as a project for us to try. Thank you for posting! Thanks for your comment. May this project calm your daughter and bring her peace from above. I believe in the healing power of scripture. If you little girl still has problems sleeping please take her to a doctor to have her thyroid checked and a blood test for Celiac Disease. These two disorders can cause sleep disorders even in children.